This is the last in a series of interviews conference chair Kathryn Craft conducted with former conferees that made successful publishing connections at The Write Stuff conference. Kathryn Craft: You met your publisher, Karen Syed, at The Write Stuff conference last year. Tell us how your pitch session went. Were you nervous? Any advice for people pitching for the first time this year? Kieryn Nicolas: My pitch session went great. I was nervous, because I’d never done a story pitch before. The concept and structure was completely foreign. But Karen was extremely nice, and I felt comfortable, because I was talking about writing…my problem was the time limit, because I could talk about writing for hours! My advice is to relax, and be yourself. It’s not a bad idea to make a good impression with your personality, and not just your story! KC: How did it feel to be offered a contract? I see this is for both eBook and print. How do you like the cover? KN: So not to be spending my summer biting my nails, I tried to focus on other things after submitting my manuscript, like more writing. When I got the news I was chatting with my good friend, and I was so surprised I just said, “Whoa. I’m going to be published.” Then it hit me, and I started screaming. I’m a big fan of the cover. I met my friend (the same one I was talking to when I got my contract) at our old middle school and we had a “photo shoot” where I took pictures of her to put on the promo cover. I later was discussing my favorite pictures and cover ideas with my cousin. He asked me to send them to him, and within a few hours he’d come up with the layout and effects of the cover picture. I loved it, and my publisher agreed, so it became the official cover! KC: How did the editing process go? Tell us about your experience. KN: I’d heard that the editing process was tough, and it hasn’t disappointed me. I’ve been through content and technical edits, and I could probably recite my story by now—or I’ve at least memorized how it looks. When my editor sent me back a version where she had made some edits, I was able to see where words had been switched around or punctuation interchanged without indicators! But even though it got tedious at times, I was glad to do it. KC: As concerns the powering up of your PR machine--blog, website, social networking, etc.--did Echelon help you at all in its development? If not, how have you figured out what to do? KN: Echelon definitely helped me out. I was given suggestions as to what to do—such as sites to join, facebooking, blogging, etc.—and there are always emails circulating from Echelon and Echelon authors with ideas and tips for PR. Other than that I’ve been spreading the word in person and scheduling author events. A member of the Greater Lehigh Valley Writers Group, Kieryn Nicolas, 15, resides in central Pennsylvania with her parents, younger sister, their lovable yellow lab, black cat, and ten hens. Kieryn was a competitive figure skater for nine years and is currently working hard to advance in taekwondo. She loves school and spending time with her close friends. She also loves to read, write, eat chocolate, and travel, with hopes of someday seeing Brisbane, Australia—a setting in her book—herself. 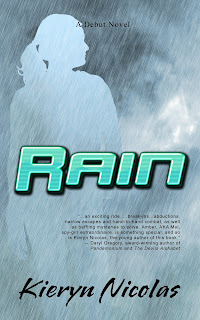 Echelon Press released Rain in e-book format in January 2010 will publish the novel in print later this year. Write Stuff registration will be open through March 12. Space still remains in keynote James Frey's two-full-day pre-conference workshop, "How to Plot Like the Pros."